There were jokes about Hitler--his background, his appearance, his path to power, his personal life, his personal traits like being superstitious and vindictive, his success, and ultimately, his decline. Jokes about other personalities--Hermann Göring, Joseph Goebbels, Rudolf Hess, Ernst Röhm, Joachim von Ribbentrop, Robert Ley--were also popular. 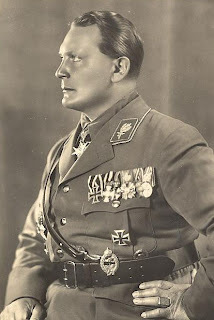 Indeed, jokes about Göring were the first to circulate throughout the Third Reich, and Göring, in contrast to Hitler, had a good sense of humor. There were rumors that he collected jokes about himself, paying ten marks for any new joke.